Dani Pedrosa has penned a new two-year deal with Honda. The expected announcement finally arrived at the new Motorland Aragon track earlier today with the Spaniard signing for 2011 and 2012. Pedrosa has never raced for another manufacturer in his entire Grand Prix career and won 125 and 250GP titles for the Japanese factory. He is currently enjoying the best season of his career in MotoGP having won back-to-back races for the first time in Indianapolis and Misano recently. 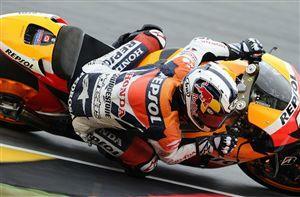 His victory tally that currently stands at four is easily his best performance since he graduated to MotoGP in 2006. He currently trails bitter Spanish rival Jorge Lorenzo by 63-points going into Sunday’s Motorland Aragon clash and the 24-year-old said: “I’m really happy to be signing with Honda again. This has been the team of my dreams since I was a kid and that’s still the same feeling I have now. We’ve had a long and successful relationship already and we believe together we can have even more success in the future. Tetsuo Suzuki, HRC President, said: “We are very pleased that Dani Pedrosa has re-signed to be a factory Honda rider, thus extending his longstanding and successful partnership with HRC. Dani is clearly at the peak of his powers and has gelled with the RC212V to create a formidable combination. We believe his relationship with the machine and the team will continue to grow and that he will mount an extremely strong challenge for the MotoGP world title over the next two seasons." Pedrosa is expected to partner 2007 world champion Casey Stoner next season, but today’s HRC statement made no reference of its final 2011 line-up. HRC is still to finalise details of its factory line-up as a contract dispute with Italian rider Andrea Dovizioso lingers on. Dovizioso is adamant he will be a Repsol Honda factory rider in 2011 having invoked a clause in his contract at the end of July. If he was in the top five in the standings after Laguna Seca, then he automatically secured a contract. He duly obliged and that situation has created a major headache for Honda management. Honda’s plan to run a three-rider factory squad was hit by a lack of investment, with Repsol unwilling to increase its budget to fund another RC212V machine. One factory insider has described the current situation inside Honda as ‘chaos’, with Dovizioso insisting he will not be sidelined into the Gresini squad or LCR satellite team.